Every time I review a Compile Heart game I can’t help but analyse how it fits into the company’s now well-established formula. Its penchant for stat heavy JRPGs with fiendishly complex combat systems and trope laden anime stories makes it a love-or-hate company, but it’s hard to deny that with each subsequent game comes an extra layer of polish and refinement to an ultimately solid core concept. 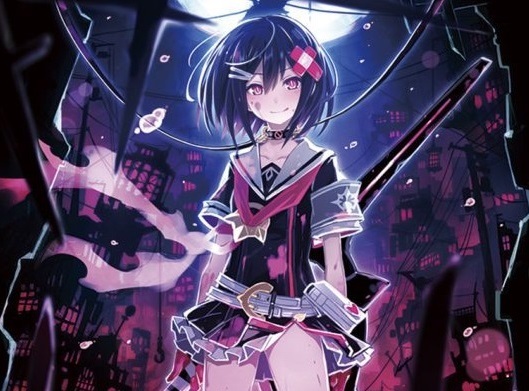 Mary Skelter: Nightmares is another in the line of the studio’s more “serious” games like Fairy Fencer F, distancing itself from the crassness of the Neptunia and Moe games. While its story is peppered with darker and more confronting moments, it’s still a Compile Heart game, and the studio’s calling cards of anime sensibilities and potent fanservice rear their heads from time to time. The result is a game which struggles to be insightful, both in its narrative and its mechanics, but is a fantastically entertaining ride nonetheless. The premise is that in the near future, a chasm appeared in an unnamed Japanese city and a sentient jail swallowed up its population, forcing them to endure captivity and weird torturous regimes. Within this jail dwelled otherworldly beasts known as Marchens, and a resistance faction known as the Dawn which aimed to create a safe space for humans while trying to escape the jail’s clutches. Out of the prisoners, some survivors known as Blood Maidens react when splattered with Marchen blood – manifesting weapons and gaining joy from killing the beasts. The story follows Alice, a newly awakened Blood Maiden, and Jack, a boy who finds out his blood holds special powers in cleansing the Marchens’ corruptive forces. 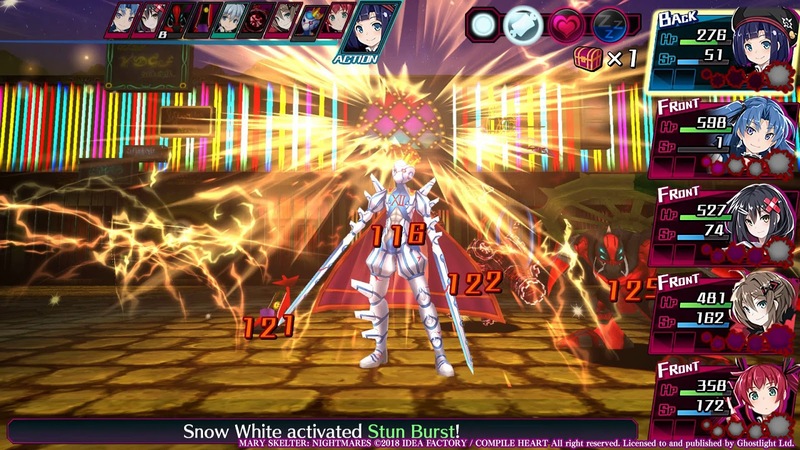 From the first dungeon, I was surprised at how closely Mary Skelter’s gameplay vision aligns with Atlus’s Etrian Odyssey series – it’s a dungeon crawler interested in tightly tying together exploration and combat mechanics. In some dungeon crawlers, puzzles can become a drag because you’re not engaging in the well-designed combat system, or random encounters can stagnate your efforts to explore and immerse yourself in the game world. 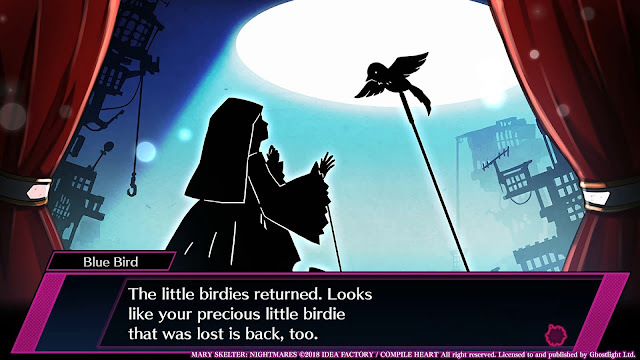 Mary Skelter fixes this by aligning the costs and rewards of both gameplay modes, so that you’re always thinking about exploration while in combat, and always thinking about combat while exploring. Movement is done in first person and each subsequent visited tile gets added to a bare-bones map, which makes every first venture into a new area a mystery. The maps are built with refreshing amounts of depth and detail – there will be waypoints and unique markers to remind players of where they have been, and plenty of chests and collection points to make the dead ends worthwhile. The designers also like putting more unorthodox movement options such as tightropes over chasms, mine-cart rides and one-way jumps to prevent exploration from becoming stale. Combat is turn based and strategic, but also builds towards a theme of attrition. Characters have a basic attack and a variety of magic skills, where a basic element-advantage system allows for more observant players to capitalise on their opponents’ weaknesses. Hitting an enemy’s weak spot or killing them with a strong blow causes bright pink blood to splatter upon the party, and once a character is soaked with enough enemy viscera they can either enter a buffed state which heightens their combat abilities, or descend into a frenzy, attacking their own party members. Characters can also lick blood off their team members to activate small heals or other positive effects. All of these actions are governed by SP, which is difficult to replenish cheaply and will force you to leave a dungeon prematurely if you’ve run out. The game also has two signature mechanics which tie these two systems together even more closely. The first are the game’s Nightmares – dungeon specific bosses which appear on the field similar to Etrian Odyssey’s F.O.E.’s, but these move in real time. Once they appear, the dungeon goes black and you’ll lose access to the map. They are also invincible until you defeat the dungeon’s core, and even then their fights still pose a significant challenge. Once they appear, you’ll want to get as far away from them as fast as you can, and if a random encounter appears on your way, you’d better dispose of those enemies fast. 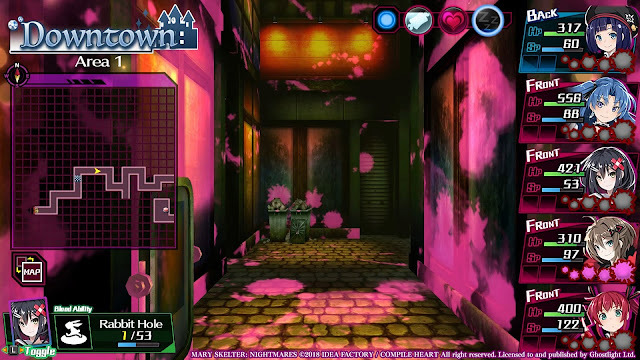 Running around the game’s perilous corridors with a grotesque nightmare on your tail is a hauntingly memorable experience, and it’s something which sets Mary Skelter apart from other dungeon crawlers. The other is due to the sentient jail that forms the dungeons you travel through – it has its own wants and needs, namely its hunger, libido and tiredness, and by performing certain actions you can trigger a bonus roulette which can help you explore the dungeon for a little bit longer. Hunger is filled by killing enemies, libido by finding special zones within the dungeons and the jail can sleep in quiet periods of no combat, so players will have an additional system to think about while exploring the various locales. Mary Skelter bears a staggering amount of options and things to do, for a game of its scope. You’ll eventually command a small army of Blood Maidens, each with customisable classes, unlockable skills and a variety of combat equipment. The game’s robust crafting system ensures you’ll be customising each character to best suit your strategy, and while there are a few game-breaking tactics available early on, the bosses and unique enemy designs always keep you reworking your plans. Unfortunately, some of the less desirable baggage that comes with Compile Heart’s design philosophies weigh down Mary Skelter. The game’s dialogue is verbose and reliant upon visual novel segments in between dungeon excursions. The writing tends to intersperse quips, one-liners and character-based humour in with the plot relevant details, which causes the plot exposition to drag far longer than it needs to. Despite this, the characters never quite feel fully realised. I would have preferred an option to chat with the characters in-dungeon, since I never wanted to skip dialogue in case I missed plot details, but I also didn’t see the need to read all the character banter the game offers. As with many other Compile Heart games, there’s also relationship values and an odd touching minigame (the original release used the Vita’s touchscreen) but you can thankfully ignore these and still have the full experience of the game. 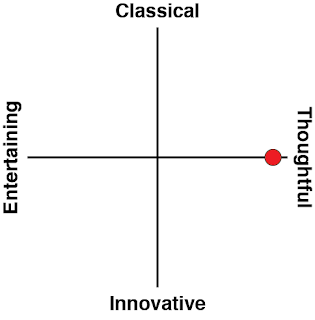 Thematically, the game is a hodgepodge of ideas which is hard to take seriously. The game’s fairytale inspired protagonists bear an optimism and humour which clashes with the grindhouse aesthetics of the sentient jail and licking monster blood off teammates. The game’s more confronting moments are rarely shown through CG but rather described in text – and there is a fair share of disturbing ideas that get addressed across the game’s lengthy runtime. The boss enemies are fitting of the name Nightmare, and are both creative and unsettling. In the thick of it all however is Jack. He’s an archetypal anime protagonist male who is a lovely person, if a little timid, but his presence in the story feels out-of-place and his usefulness in battle is laughably poor. His default action when you first control him is to wait and do nothing, or he could choose to guard a teammate and take an enemy hit on their behalf. It’s soon discovered that his blood has magical cleansing properties however, and so he learns to use the Mary Gun, which shoots his own blood to snap the various heroines out of their Blood Skelter frenzy. As with most male leads in Compile Heart games I imagine he’s there as an audience surrogate – his goals align most closely with the player’s after all, and he is by far the most “normal” of the whole cast – but I couldn’t help but feel his optimism and naivety came to weigh down the story’s more serious moments. Thematic problems aside however, the plot is filled with enough twists and turns to stay interesting throughout the game’s expansive runtime, and while the individual visual-novel segments might start to grate, they do a good job of breaking down the dungeoneering. 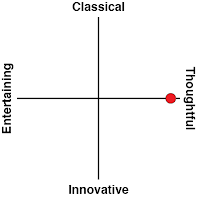 The core gameplay remains very strong and is enough on its own to carry genre fans through the single player content. Mary Skelter: Nightmares shows Compile Heart moving a little away from its otaku-pandering roots and more towards an orthodox standard of JRPG design – and despite being the studio’s first attempt at trying a new style, it’s surprising how much of it works.